Tequila Herradura (officially Grupo Industrial Herradura) is a tequila distiller located in Amatitán, Jalisco, Mexico. It was formally founded in 1870 by Félix López and the business remained in the family for over 125 years. Today it is owned by US beverage maker Brown-Forman, but the tequila is still made in the same place and facilities under a Mexican subsidiary. Tequila products sold under the Herradura name are 100% agave. The company makes other tequila products such as El Jimador, which is the best selling tequila in Mexico, as well as New Mix, a tequila and grapefruit soda beverage. Since its acquisition by Brown-Forman, Herradura has had a number of promotional efforts in Mexico and the United States, including inviting artists to use tequila barrels at the bases for art pieces, which are then displayed and auctioned off for charity. The first known owner of the tequila producing property was Feliciano Romo in the early 19th century. The official history of Herradura begin with Félix López, who began as the distillery administrator under then owners Josefa Salazar and her sons. In 1870, López took over the distillery and agave fields and registered it as a tequila producer under the name of Hacienda San José del Refugio. Félix López married Carmen Rosales and they had two children, Aurelio and María de Jesús. The couple modernized the production of tequila at the hacienda, building a facility that remained in use until 1963. López died in 1878 and Rosales took over the business along with her brother Ambrosio Rosales and his wife Elisa Gomez Cuervo. Later, the business was inherited by Aurelio López. The construction of railroads in the late 19th century allowed for easier shipping to other parts of Mexico and increased tequila’s popularity in the country. By this time the hacienda’s tequila was well known, with Aurelio giving it the name of Herradura. The name, which means horseshoe in Spanish, is a said to have come from the finding of a horseshoe on the hacienda property. Stories vary but the one told by the company’s website says that it was found in the early 1900s by Aurelio, while inspecting the agave fields. It gleamed like gold and the horseshoe was kept for luck then naming the tequila after it. In the 1920s the Cristero War broke out, with both Aurelio and his sister María de Jesus as sympathizers. At one point government troops surrounded the hacienda but the siblings were able to escape. However, Aurelio never returned to the hacienda again. The hacienda passed into the hand of Aurelio’s cousin David Rosales, who kept the tequila 100% agave despite the trend towards blending to cut costs. In 1928, he registered the Herradura brand in Mexico City with a horseshoe as its logo. María de Jesús was able to return to Herradura and distinguished herself with charitable works to the town of Amatitán, including the building of wells in an area with little water. The hacienda and the Herradura brand remained in the family for over a century. In the 1960s, the old factory was shut down in favor of a new one, but kept as a museum. During this time Herradura Añejo Tequila was introduced with Reposado introduced in 1974. In 1994, el Jimador brand was introduced and became the #1 seller in Mexico. New Mix, a ready-made tequila cocktail was introduced in 1997 and also became the best selling beverage of its kind. In the 1990s, there was conflict over sales of shares in the company by some members of the family as well as agave growing land. Part of the legal problems stemmed from the sale of shares to non-Mexican entities. In 2004, Herradura bought back foreign owned shares, making the company 100% Mexican owned again. At this time, the company controlled thirty percent of the Mexican tequila markets behind Jose Cuervo’s forty percent share. However, in 2007 all assets of the company were sold for $USD 776 million to the US-based company Brown-Forman, which produces other alcoholic beverages such as Jack Daniel's, Southern Comfort, Finlandia Vodka and Korbel California Champagne. That same year Herradura was named "best distillery of 2007" by Wine Enthusiast Magazine . Since 2007, the brand has slowly become more internationally recognized. When Brown-Forman bought it, the brand was sold in fifty three countries. Today, it is sold in 136 countries through the Brown-Forman network in Europe, South America, North America and Asia. Its market share in the United States and other countries has been growing as well. Although owned by Brown-Forman, the facilities are still based in Amatitán, Jalisco is run by Grupo Industrial Herradura under manager Randy McCann. The hacienda is the setting to a number of legends and ghost stories. These include sightings of old conquistadors and stories related to the various tunnels that were dug on the hacienda property during the Cristero War. Over its history, the company has run all aspects of tequila production from growing the agave to bottling the final product. Herradura brand tequilas are still made with agave hearts roasted in clay ovens and fermented with wild yeast. In the late 2000s, the company invested about 15 million USD in water treatment plants, the Amatitán distillery, new laboratories and other facilities. The plant has an ISO 9001-2000 ranking from AENOR México and produces eighteen million liters annually. The hacienda is part of the tourism sector of the area’s economy as well with the Tequila Express train arriving to it and Amatitán from Guadalajara . Herradura produces tequila and tequila based beverages under the Herradura, Hacienda de Cristero, Grand Imperio, El Jimador and New Mix names. Herradura brand tequilas are 100 % blue agave. As an authentic tequila, bottles bear certification from the Mexican government. Herradura brands include Herradura Blanco (46% alcohol), Herradura Blanco Suave (40%), Herradura Reposado (40%), Herradura Antiguo (38%), Herradura Añejo (40%) and Selección Suprema (40%). The best selling varieties are Reposado, Añejo and Selección Suprema. Herradura introduced their first Reposado tequila in 1974 and the Extra Añejo Selección Suprema in 1995. Reposado is aged for eleven months in wood barrels. Selección Suprema is aged for 49 months in oak barrels. In 2012, the company redesigned the package of the Selección Suprema to reflect the traditional nature in which the extra aged tequila is made. Another important brand is el Jimador, launched in 1994 and named after those who harvest agave plants. el Jimador is 100% agave tequila. It is currently the best-selling tequila in Mexico with a twelve percent market share. New Mix is a canned tequila and grapefruit soda drink with five percent alcohol. It is also the best selling product of its type in Mexico. Herradura, in 2013 under the sub-label "Colección de la Casa" released in limited areas (Mexico, United States, El Salvador and Australia.) two new Reposado Tequilas partially aged in non-traditional barrels. One Aged in oak then in Port barrels  and another partially aged in Cognac barrels as well as traditional oak. Since its acquisition by Brown-Forman, Herradura has had a number of promotional efforts in the United States and Mexico. Herradura was promoted as the "Official Tequila for the Kentucky Derby" in 2008. In 2010 it created a program called "Buy-the-Barrel" in the United States aimed at tequila connoisseurs to purchase an entire barrel of Reposado, which yields about 240 bottles. In 2011, the company began the "Arte en Barricas" (Art in Barrels) competition, inviting artists to use tequila barrels to create artwork. For its 142nd anniversary in 2012, the company invited 142 artists, forty four of them well-known such as José Luis Cuevas and Sebastián. The artists participated in Arte en Barricas for three prizes of 20,000 pesos and one prize of 10,000 pesos. The resulting works were displayed in various museum in the country then auctioned off with the proceeds going to four charities: Bécalos, the Museo de Arte Popular, Sólo por Ayudar and Hogar Cabañas. ^ a b "Casa Herradura" [Herradura House] (in Spanish). Jalisco, Mexico: Tequila Express. Archived from the original on June 22, 2013. Retrieved November 17, 2012. ^ a b c Paulina Vázquez (July 10, 2012). "Historias de un tequila sofisticado" [Stories of a sophisticated tequila] (in Spanish). Mexico City: GQ México magazine. Retrieved November 17, 2012. ^ a b c d e f g "La Familia". Jalisco, Mexico: Grupo Industrial Herradura. Archived from the original on November 25, 2012. Retrieved November 17, 2012. ^ "Hacienda San José del Refugio". Jalisco, Mexico: Grupo Industrial Herradura. Archived from the original on November 23, 2012. Retrieved November 17, 2012. ^ "Nombres, Nombres y... Nombres/ El conflicto en Tequila Herradura" [Name, Names … and Names/The conflicto at Tequila Herradura]. El Norte (in Spanish). Monterrey, Mexico. June 18, 1999. p. 5. ^ "Tequila Herradura vuelve a ser 100% mexicana" [Tequila Herradura returns to being 100% Mexican]. NoticiasFinancieras (in Spanish). Miami. July 9, 2004. p. 1. ^ "Brown-Forman Completes Casa Herradura Acquisition for $776 Million". Brown Forman official website. January 18, 2007. Retrieved August 3, 2016. ^ "Brown-Forman Corp.: An Agreement Is Reached To Buy Tequila Maker's Assets". Wall Street Journal. New York. August 29, 2006. p. A10. ^ a b c d "Tequila la Herradura, reconocida como "Mejor destilería de 2007" en EU" [Tequila Herradura, recognized as the "Best distillery of 2007" in the US]. Crónica (in Spanish). Mexico City. January 29, 2008. Retrieved November 17, 2012. ^ a b c d "Herradura renueva empaque del tequila extra-añejo Selección Suprema" [Herradura renews packaging of the extra aged Selección Suprema tequila] (in Spanish). Mexico City: TV Notas magazine. October 25, 2012. Archived from the original on October 29, 2012. Retrieved November 17, 2012. ^ a b c d e "Churchill Downs(R) Appoints Tequila Herradura(R) as the Official Tequila of the 2008 Kentucky Derby(R): Herradura Joins Other Brown-Forman Brands as the Official Toast of the Track". PR Newswire. New York. April 22, 2008. ^ a b c d e "Crece Tequila Herradura" [Tequila Herradura grows]. Mural (in Spanish). Guadalajara. August 28, 2008. p. 6. ^ a b c "Apuesta Herradura a Jalisco" [Herradura betsw on Jalisco]. Mural (in Spanish). Guadalajara. August 23, 2009. p. 6. ^ "Mysteries". Jalisco, Mexico: Grupo Industrial Herradura. Archived from the original on November 25, 2012. Retrieved November 17, 2012. ^ a b "Brown-Forman Corporation; Tequila Herradura Leverages 140 Years of Tradition and Authenticity to Redesign Packaging". Telecommunications Business. August 12, 2009. ^ "Tequila Express". Jalisco, Mexico: Grupo Industrial Herradura. Archived from the original on October 27, 2012. Retrieved November 17, 2012. ^ a b "Hall of Famer Emmitt Smith Kicks Off Tequila Herradura's Exclusive Buy-the-Barrel Program: Program Personalizes and Certifies Barrels for Each Order". PR Newswire. New York. June 11, 2010. ^ "Convocatoria Herradura Arte en Barricas Edición 2012" [Open call for Herradura Arte en Barricas edition 2012] (in Spanish). Mexico: Government of Mexico City. Archived from the original on December 20, 2012. Retrieved November 17, 2012. ^ a b "Se subastan barricas" [Barrels auctioned off]. Milenio (in Spanish). Mexico City. November 15, 2012. Archived from the original on January 28, 2013. Retrieved November 17, 2012. ^ "Tequila Herradura festeja 142 años" [Tequila Herradura celebrates 142 years]. Gaceta Palacio (in Spanish). Mexico: Palacio de Hierro. October 26, 2012. Archived from the original on November 2, 2012. Retrieved November 17, 2012. Tequila is a regional distilled beverage and type of alcoholic drink made from the blue agave plant, primarily in the area surrounding the city of Tequila, 65 km (40 mi) northwest of Guadalajara, and in the Jaliscan Highlands of the central western Mexican state of Jalisco. Aside from differences in region of origin, tequila is a type of mezcal. 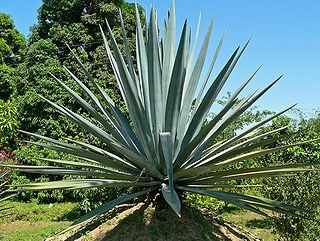 The distinction is that tequila must use only blue agave plants rather than any type of agave. Tequila is commonly served neat in Mexico and as a shot with salt and lime across the rest of the world. Santiago de Tequila is a Mexican town and municipality located in the state of Jalisco about 60 km from the city of Guadalajara. Tequila is best known as being the birthplace of the drink that bears its name, “tequila,” which is made from the blue agave plant, native to this area. The heart of the plant contains sugars and had been used by native peoples here to make a fermented drink. After the Spanish arrived, they took this fermented beverage and distilled it, producing the tequila known today. The popularity of the drink and the history behind it has made the town and the area surrounding it a World Heritage Site. It was also named a "Pueblo Mágico" in 2003 by the Mexican federal government. Tequila has also been famous for being the prime setting in the successful Televisa telenovela Destilando Amor, starring Angélica Rivera and Eduardo Yáñez. Patrón is a brand of tequila products by the Patrón Spirits Company. Dos Lunas is a line of 100% blue agave tequilas produced in Guadalajara, Jalisco, Mexico, by Dos Lunas Spirits, LLC, headquartered in El Paso, Texas. The brand has the first triple-distilled silver tequila, a month aged Reposado, 18 month aged Añejo and 10 year old Extra Añejo. Casa Noble is a brand of premium 100% blue agave tequila produced by the Casa Noble Tequila Company. It is a CCOF certified organic tequila. Casa Noble is distributed in the United States by Constellation Brands Inc. The tequila is made from estate-grown agaves cooked in traditional stone ovens; these are naturally fermented and distilled three times. Casa Noble Reposado and Añejo are aged in White French Oak. Tequila El Espolòn is a brand of tequila from Campari America. The tequila is produced by the San Nicolas Distillery in the Los Altos (Highlands) region of Jalisco, Mexico, famous for its cultivation of agave plants. Amatitán is the head of a municipality in the Mexican state of Jalisco, and is home to one of the world's largest tequila distilleries. The Tequila Express is a Mexican regional train service that operates from Guadalajara, Jalisco, to the Tequila Herradura distillery at the San José del Refugio Hacienda in the municipality of Amatitán, Jalisco. Amatitán is approximately 40 kilometres (25 mi) northwest of Guadalajara and 32 kilometres (20 mi) southeast of the town of Tequila, Jalisco. The train service is so named because it features tequila tastings and transports its passengers through blue agave fields to the distillery in Amatitán and towards the town of Tequila. Don Julio is a brand of tequila produced in Mexico. It is the largest brand in value and eighth largest in volume. It is distilled, manufactured, bottled, sold, and distributed by Tequila Don Julio, S.A. de C.V. from its corporate facility in the Colonia El Chichimeco district, in the city of Atotonilco El Alto, Jalisco, Mexico. It is distributed in the United States by Diageo, under licensing from its patent holder, Tequila Don Julio, Sociedad Anónima de Capital Variable, Jalisco, Mexico, but it is sold worldwide. El Tesoro is a brand of tequila produced at a distillery in Jalisco, Mexico, where the family that founded the distillery is still involved in the business. In the United States, the brand is marketed by Beam Suntory. The producer claims to use labor-intensive traditional methods for making the tequila. Sauza Tequila Import Company is a producer of tequila located in Tequila, a municipality of the state of Jalisco, Mexico. It was founded in 1873 when Don Cenobio Sauza started La Perseverancia distillery. Sauza Tequila Import Company is owned by Beam Suntory, headquartered in Chicago, Illinois. Their products include: Sauza, Conmemorativo, Hornitos, Tres Generaciones. Lunazul Tequila is a 100% blue agave tequila produced by the Tierra de Agaves company. Voodoo Tiki is a brand of tequila, produced by Voodoo Tiki Tequila Corporation, made of 100% blue agave, and available in the US other several other Countries including, Canada, The Caribbean, Australia, Belgium and the Netherlands. Tres Agaves is a brand of Tequila produced in the town of Tequila located in Jalisco, Mexico. Santera Tequila is a brand of tequila 100% blue weber agave tequila produced and bottled in Jalisco, Mexico.